The new Church of Scientology Sacramento Ideal Organization was dedicated January 28, 2012, in ceremonies attended by 2,500 Scientologists and their guests. 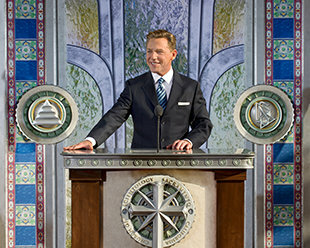 Mr. David Miscavige, Chairman of the Board Religious Technology Center and ecclesiastical leader of the Scientology religion, presided over the ceremonies. Special guests on hand to commemorate the opening were Sacramento Mayor Kevin Johnson; Greater Sacramento Urban League president David DeLuz; Interfaith Council of Greater Sacramento president Jon Fish; California State Assembly Member Mike Gatto; and International Faith-Based Council president and founder Bishop Ron Allen. The Church of Scientology Sacramento celebrated the grand opening of their new Church, an historic landmark originally built in 1930 as the Ramona Hotel. Scientologists, guests and neighbors, as well as leading city and state officials, convened for the dedication. On January 28, 2012, 2,500 Scientologists and guests celebrated the grand opening of this Church of Scientology Ideal Org. The Church’s new landmark home downtown stands just blocks from the State Capitol and the Old Sacramento Historic District. Officiating the grand opening ceremony was Mr. David Miscavige, Chairman of the Board Religious Technology Center and ecclesiastical leader of the Scientology religion. He was joined on stage for the ribbon cutting by Sacramento Church officials and parishioners. Joining Mr. David Miscavige, Chairman of the Board Religious Technology Center and ecclesiastical leader of the Scientology religion (center right), for the dedication of the new Church of Scientology Sacramento were (left to right): Greater Sacramento Urban League president David DeLuz; California State Assembly member Mike Gatto; Sacramento Mayor Kevin Johnson; Interfaith Council of Greater Sacramento president Jon Fish; and International Faith-Based Council president and founder Bishop Ron Allen. 2,500 Scientologists, guests and officials flooded into the new Church following the dedication ceremony on January 28, 2012. The reception opens onto the Public Information Center presenting the beliefs and practices of Dianetics and Scientology, as well as the life and legacy of Founder L. Ron Hubbard. The new Church of Scientology Sacramento stands just blocks from the State Capitol. The historic building, originally opened in 1930 as the Ramona Hotel, is one of Sacramento’s most prominent architectural landmarks. The Church meticulously restored the seven-story structure, preserving Sacramento’s finest example of the Spanish Colonial Revival style. The Church of Scientology reception now welcomes all visitors, where they may receive introduction to Dianetics and Scientology. The Church of Scientology Public Information Center welcomes visitors from morning to night, inviting them to learn about Dianetics and Scientology and the many humanitarian programs sponsored by the Church. Visitors are invited to tour at their leisure and return as often as they like. The Public Information Center presents hundreds of films on the fundamental beliefs and practices of Dianetics and Scientology. It further offers visitors informational literature and DVDs on the many activities of Churches of Scientology around the world. Among the multimedia displays in the Public Information Center is an exhibit dedicated to the life and legacy of Scientology Founder L. Ron Hubbard. The café, adjoining the Public Information Center, is open to parishioners as well as visitors touring the Church or attending scheduled activities. The Chapel can also be configured to accommodate banquets, receptions and events to commemorate significant occasions. The Chapel further serves as a venue for public gatherings, including seminars, workshops and a host of community events. The Church provides evening and weekend introductory seminars presenting fundamental principles of Dianetics and Scientology. An entire wing of the Church is devoted to introductory courses. Scientology introductory services include the Success through Communication Course. The Purification program was developed to free individuals from the mental and spiritual ill effects caused by drugs. The Purification Center features a painted glass mural depicting the city’s landmark Tower Bridge and Capitol Building. Each of the numerous auditing (spiritual counseling) rooms provides the ideal distraction-free environment necessary to achieve spiritual enlightenment. In the Academy, Scientologists study to become auditors (spiritual counselors). The Office of L. Ron Hubbard, traditional in all Churches of Scientology, stands in honor of the Founder and symbolizes that this Church is true to his writings and ideals. The Ramona Building, originally opened in 1930, is listed in the Sacramento Register of Historic and Cultural Resources. The building stands as the city’s finest surviving example of original Spanish Colonial Revival architecture. Church renovation of the landmark building was planned and executed for minimal environmental impact and maximum sustainability, meeting the U.S. Green Building Council’s Leadership in Energy and Environmental Design (LEED) gold certification standards. The Church meticulously preserved the Ramona Building, restoring its Spanish Colonial Revival features to their original glory, including the characteristic stucco, ornamental glazed brick and terra cotta tiles, and decorative iron accents. The Church’s new home downtown at the crossroads of 6th and J Street, Sacramento’s historic main thoroughfare, stands just blocks from the State Capitol and is one of the city’s most prominent architectural landmarks. When the building was dedicated on January 28, 2012, it signified the preservation of a Sacramento treasure for generations to come. California’s capital celebrated the grand opening of the new Church of Scientology of Sacramento on Saturday, January 28. The dedication ceremony was attended by more than 2,500 Scientologists, guests and city, state and national officials. Mr. David Miscavige, Chairman of the Board Religious Technology Center and ecclesiastical leader of the Scientology religion, officiated at the Church of Scientology of Sacramento dedication ceremony. The Church’s new home, located just blocks from the State Capitol, is one of the city’s most prominent architectural landmarks. Originally opened in 1930 as the Ramona Hotel and designed by California’s first state architect, the building is Sacramento’s finest surviving example of the Spanish Colonial Revival style. The Church meticulously preserved the building’s structure and restored its features to their original glory, including the characteristic stucco, ornamental glazed brick and terra cotta tiles, decorative iron accents and the original blade sign. All restoration was planned and executed for minimal environmental impact and maximum sustainability, meeting the U.S. Green Building Council’s Leadership in Energy and Environmental Design (LEED) gold certification standards. The grand opening of the new Church was distinguished by the presence of Mr. David Miscavige, Chairman of the Board Religious Technology Center and ecclesiastical leader of the Scientology religion, who officiated at the ceremony. Also in attendance and commemorating the occasion were Sacramento Mayor Kevin Johnson; California State Assembly Member Mike Gatto; Greater Sacramento Urban League president David DeLuz; Interfaith Council of Greater Sacramento president Jon Fish; and International Faith-Based Council president and founder Bishop Ron Allen. The new Ideal Church of Scientology of Sacramento rises seven stories and measures 57,000 square feet. In addition to its central Chapel for all congregational gatherings, Sunday Services and religious ceremonies, the Church further includes multiple seminar rooms and classrooms, in addition to dozens of rooms for Scientology auditing (spiritual counseling). The entirety of the ground floor has been reserved for Introductory Services, welcoming visitors and those wanting to find out about Scientology for themselves. It further includes an expansive Public Information Center, providing a complete introduction to the beliefs and practices of the Scientology religion, as well as the life and legacy of Scientology Founder L. Ron Hubbard. The Information Center additionally presents a detailed overview of Church-sponsored humanitarian programs, including a worldwide human rights initiative; an equally far-ranging drug education, prevention and rehabilitation campaign; a global network of literacy and learning centers; and the Scientology Volunteer Minister program now comprising the largest independent relief force on Earth. In full, the Information Center’s multimedia displays offer some 500 informational and documentary films at the touch of a button. The Center is open morning to night and visitors are invited to tour at their leisure and return as often as they wish.